The canter is a controlled, three-beat gait performed by a horse. It is a natural gait possessed by all horses, faster than most horses’ trot but slower than the gallop. 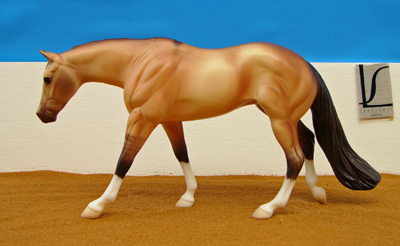 A variation of the canter, seen in western riding, is called the lope and is generally quite slow. 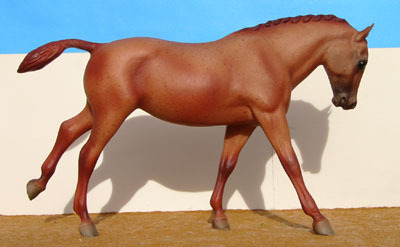 The "lead" of a canter refers to the order in which the legs are placed, and is determined by which leg is the last to ground before the suspension phase. If the left hind leg is placed first (beat one), which would then be followed by the right hind and left foreleg (beat two), before the right foreleg (beat three), the horse is said to be on the "Right Lead." If the right hind leg is beat one, then the left foreleg will be the last leg to ground, and the horse will be said to be on the "Left Lead." Therefore, a person on the ground can tell which lead the horse is on by watching the front and rear legs and determining which is the last one to touch the ground, but may also simply watch to see on which side the legs are literally "leading", landing in front of the opposing side. When the horse is on a lead, the legs on that side (usually the inside front and hind) have greater extension than those on the other side (usually the outside front and hind). Therefore, a horse on the Right Lead will have its right hind (beat two) come slightly further under its body than the left hindleg had when it grounded (beat one), and the right foreleg (beat three) will reach further out from the horse's body than the left foreleg had extended (beat two). In general, the horse is on the "correct" lead when it matches the direction it is going. So a horse turning to the right should be on the Right Lead, a horse turning to the left should be on the Left Lead. However, just as people find it easier to write with one hand or the other, most horses have a "better side", on which they find it easier to lead at a canter. In limited circumstances, mostly in dressage training, a horse may be deliberately asked to take the lead opposite of the direction it is traveling. In such cases, this type of canter is called a counter-canter. A variant canter, involving the same sequence of beats but variant footfalls in beats one and two, is often referred to by equestrians as cross-firing, cross-cantering, or disunited canter, among other terms. To the observer, the horse appears to be leading with one leg in front, but the opposite leg behind. It is produced by an improper sequence of footfalls. The problem with this sequence is in beat two: the grounded hind and foreleg are NOT diagonal pairs, but are on the same side of the horse (in this case, the outside). This means that the horse is balancing on only one side of its body, which is very difficult for the horse, making it hard to keep the animal balanced, rhythmical, and keeping impulsion. A horse that is cross-firing cannot perform to the best of its ability, and can even be dangerous (such as an unbalanced, cross-firing horse who must jump a huge, solid cross-country obstacle). Additionally, it makes for a very uncomfortable, awkward ride, producing a rolling movement often described as riding an eggbeater, which makes it difficult for the rider to perform to the best of his or her abilities. The most important function of the correct lead is for balance. While they are unimportant on a straight line, they can greatly influence the athletic ability of a horse on turns, especially if the turn is tight or performed at speed. Horses naturally lean in to the direction they are turning. Since they extend their lead-side legs further out, they may use them to balance themselves as they lean into that direction. So, if on the Right Lead while taking a right turn, the right hind will be positioned more under the body, and the right foreleg more in front of the body, to act as a stabilizer as the horse turns. When on the incorrect lead, the horse is usually left unbalanced. In this case, correct riding can make the difference in the horse's performance. Good riding can keep the legs positioned correctly enough so that the horse is still able to perform the turn. Poor riding will hinder rather than help the horse, and in extreme situations such as a tight turn at speed, the horse may lose its legs footing and fall. Click the link below to download a PDF of the above text along with photographs for illustration.